Persistence Market Research in its new report, “Apple Concentrate Market: Global Industry Analysis and Forecast, 2016-2026,” analyzes opportunities in the market and presents updates and insights pertaining to various segments of the global apple concentrate market over the forecast period, 2016–2026. According to Persistence Market Research analysts, the global apple concentrate market is dependent on macroeconomic factors such as purchase power parity, consumer spending, apple production, and fruit juice industry growth. The report analyzes the global apple concentrate market for the forecast period of 10 years in terms of market volume and market value. 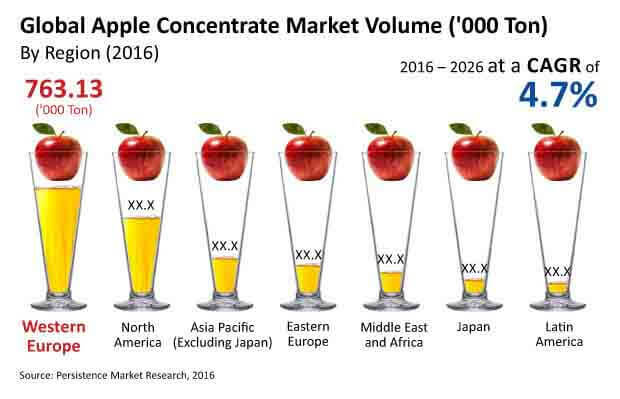 Apart from a detailed study of the product, application and regional split, the analysts have taken extra efforts to do a market survey based on ingredients and consumer buying behavior in the global apple juice concentrate market. Particularly, while researching on the part of consumer buying behavior, the analysts found out that consumers in the age group of 26-35 years are the highest consumers of juice concentrate products due to increasing awareness regarding health benefits. Macroeconomic indicators such as apple concentrate industry outlook and consumer spend patterns have been considered to arrive at the indicated market numbers. However, yearly change in inflation rate has not been considered while forecasting market numbers in the report. Bottom-up approach has been used to assess market numbers for each segment, while top-down approach has been used to counter-validate the different segment numbers. The report also includes analysis of drivers and restraints witnessed in the market. Key trends observed across the value chain are also included in the report. The report highlights existing opportunities in the global apple concentrate market to equip clients with crystal-clear decision-making insights. The market share is also estimated in this report on the basis of sales of apple concentrate across the globe. Various sources referred include company annual reports, investor presentations, analyst presentations and company press releases. The outcome has been triangulated after discussions with distributors, retailers and industry experts across the value chain. Primarily, the report takes an overview of the entire market of apple concentrate on the basis of trends, key market players and market taxonomy. Parent market overview has also been taken into consideration. A unique analysis known as pestle analysis has been conducted while drafting this report. Environmental effects on apple concentrate industries, technological innovations, trade restrictions, anti-dumping duties and change in import duties are some of the points that have been taken into consideration under pestle analysis. Another exclusive model analysts have referred to while researching this market is Porter’s five force model. Suppliers’ and buyers’ bargaining power, threat of new entrants and substitutes and rivalry among competitors are some of the important elements that make this report exceptional. The last section of the report covers the competitive landscape that provides a dashboard view of companies that manufacture products and provide services in the global apple concentrate market. The report contains company profiles of some of the key players and a strategic overview of key mergers and acquisitions along with company-wise expansion in key regions. In order to conduct expert interviews, Persistence Market Research has formulated a detailed discussion guide. A systematic research approach has been adopted while covering this report. The report leverages in-depth secondary research to ascertain overall market size, top industry players, top products and industry associations. Interviews have been conducted with industry experts, industry players, distributors, and retailers. Though the apple concentrate market in the U.S is expected to drop in value during the assessment period 2016 – 2026, the North America region is expected to remain dominant in terms of revenue contribution. According to a new analysis by Persistence Market Research, North America consumes almost all the locally produced apple concentrate and exports few thousand tons because of trade relations. The apple concentrate production in the region is estimated to be more than 140 thousand tons by 2016 end. In 2016, the market in the region was valued more than US$ 500 Mn and is expected to expand at a CAGR of 3.4% during 2016-2016 to reach a valuation of more than US$ 800 Mn by the end of 2026. Growth in the production of apple concentrate in North America is expected to be primarily driven by various application segments, where apple concentrate is largely consumed in the juice and cider industry. According to the report by Persistence Market Research, the North America apple concentrate market is flat but new innovation breaking into the market can shift the growth trend upwards. Availability of apples is the biggest challenge these days in North America. Farmers are facing challenges in apple production because of changing climate and natural disasters. Production of apple depends on water availability and favorable climatic conditions. Limited availability of apples is creating hurdles in expansion of business in North America. In North America region, apple is consumed in both raw and processed form. However, most of the population prefers to consume apple in raw form, which limits the supply of apples for processing industries. Another factor creating negative impact on the global apple concentrate market is a change in the currency values. It has became a major concern that is shifting the export and import patterns of major concentrate producers throughout the globe. The report indicates that the currency appreciation of Latin American countries in 2016 reduced the export of apple concentrates to other countries, especially the countries in North America region. Being the leading region in the consumption of apple concentrate, North America will certainly suffer due to continuous fluctuation in the currency. This particular factor is anticipated to restrain market growth. Among the three liquid concentrate sub-segments, the largest is juice concentrate, which is estimated to represent more than 90% of the market in 2016, and is expected to remain the same through 2026. Although juice concentrate is not the fastest growing segment, it is estimated to grow more than US$ 20 Mn annually over the course of the forecast period in North America and this absolute growth is larger than the other liquid concentrate segments, although it registers a lower CAGR in the North America region. Apart from juice concentrate, the new application of powder concentrate will flourish the solid concentrate market growth during the projected period in the North America region. Major players are consistently launching new innovative products in the market and also strengthening their market share by pitching their existing line of products due to increase in demand. For instance, Tree Top is bringing out new product varieties to cater to the U.S. market, including low-calorie and reduced-sugar selections, flavored applesauce, blended juices, bagged fresh apple slices, and fruit snacks. Welch Foods is focusing on launching a new juice powder variety that can replace liquid concentrates. This company is also looking for expansion of its soda range in the next year aiming at a higher demand for the product, which has exponentially increased since its launch. Tree Top focuses on apple concentrate and cider sale in the U.S. owing to decent market share of the company in the U.S. apple concentrate market.